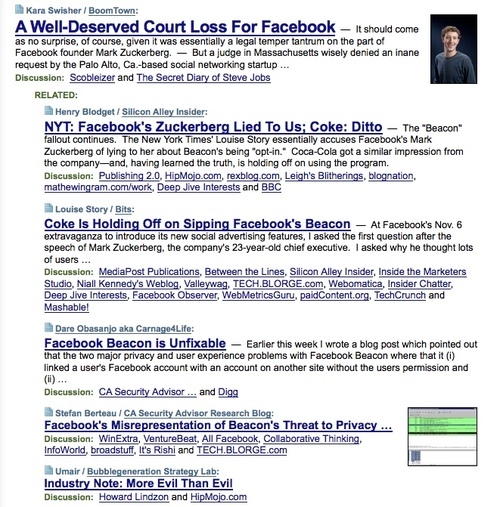 Man is there a lot of Facebook hatin’ going on at the top of techmeme this morning. It’s always like this, the euphoria is followed by the backlash. Facebook has had a great year, the evolution from a service for students to a service for everyone, the opening of the platform, and the $15bn valuation from Microsoft. It’s hard to beat the year they’ve had. But now the backlash is here. It’s largely related to their efforts to monetize their service via behavioral targeting and the social graph. I’ve said my piece on that. I welcome their efforts to use what they know about me and my friends to make my experience on Facebook better. Facebook is a faux revolutionary. There’s little but evil in its DNA. subordination and other obsolete massconomy games. I totally get what Umair is saying. He compares Facebook to Google and he sees one company that’s out to make its world better and one that is out to make the world better. Maybe that’s true, but I think Facebook’s problems are more that its trying to figure out an appropriate business model under a glare of attention that is way higher than the one Google faced back in 2000 when it launched adwords. I am optimistic that Facebook will learn and adapt and get to a good place. There’s too much at stake and it’s users can and will leave if they don’t like the experience. I’ve got three huge Facebook fans in my house and I see no evidence that is happening any time soon.